Physical education and health classes can readily incorporate environmental education. In physical education, we can explore activities such as hiking, orienteering, bicycling, archery, and skiing that offer both opportunities to stay fit and incentives to be good stewards of the natural world. Once we start thinking about greening all aspects of the curriculum, it begins to make sense that health and physical education can be viewed through an environmental and sustainability lens. "Come on, kids. It's a beautiful day today. Let's go outside for our gym class and enjoy this wonderful weather," is the easiest way to shift the context of physical education slightly, so that it's also about the Earth. When we think health and physical education, we should be thinking "outdoor education" as much as possible. Another easy shift happens when we realize that, quite often, environmentally friendly lifestyle choices contribute to fitness levels (for example, walking or bicycling to school rather than being driven). Take your students on field trips to local parks — introduce them to the outdoor recreation opportunities near their home. Health and physical education is probably the best class in which to teach about children's environmental health issues and rights. For fun and active environmental education (or to introduce your new students to your school's recycling system), hold an Environmental Field Day — including recycling relays and other stations where students combine physical movement with environmental learning (for example, predator and prey games). The good news is, healthy kids and a healthy environment are closely intertwined. 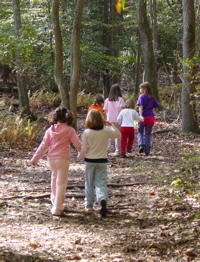 Efforts to help children understand and appreciate the natural environment often involve physical activities. Environmental education in areas such as water and air quality form a natural bridge to discussions of personal and public health.... Our children need life lessons on keeping the world around them healthy for themselves and other living things.